Adele’s best friend says the singer was the first one to spot her postpartum psychosis. 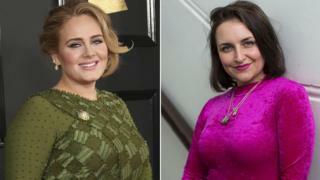 Laura Dockrill gave birth to a baby boy, who is Adele’s godson, in February this year. “She recognised it in me, I was on the phone FaceTiming her and she was the first one to detect what I might have,” Laura told Radio 1 Newsbeat. The serious mental illness affects one in one thousand mums and can lead to hallucinations after giving birth. She says her symptoms were “insomnia, delusions, suspiciousness and paranoia”, and has written a blog post to share her experience with mums who might be going through the same thing. Adele shared Laura’s story and described it as “intimate and heartbreaking”. The singer says she and Laura have been friends since they were teenagers and her song My Same, from the album 19, is about her. Laura is a poet, author, illustrator and short story writer, and she went to the same school as Adele – the Brit School of Performing Arts in Croydon. In her blog post she talks about a “horrific” labour which her doctor believes might have triggered the illness. After coming home with her son, Laura describes feeling like “I had pushed out my personality as well as a baby”. She says she had suicidal thoughts. “I was begging my sister to let me go, I was begging my mum to let me go. Laura says that her skin went pale, she couldn’t eat or drink and she started getting severe anxiety attacks. As things got worse, Laura needed her partner Hugo to send her photos of herself with friends and family to remind her who she was. Laura was hospitalised and spent two weeks away from her son. She now describes herself as recovering more and more each day and is “happy, confident and strong” after getting support from family and a psychiatrist, as well as using medication. But she also says talking about her psychosis has been a “huge” part of her recovery. “I was constantly searching for any stories that offered me hope or salvation in this dark and testing time so that’s why I’ve shared this,” she says. Vivien Waterfield from the charity Home Start praised Laura for speaking up. “It’s often very difficult for mums to talk about the difficulties they’re having,” she said. A few years back, Kathryn Grant’s postpartum psychosis was used as the inspiration for an EastEnders storyline – when Lacey Turner’s character Stacey had the condition. She told Newsbeat that she had a horrendous birth and ended up not sleeping for ten nights. “I knew I needed to go to A&E because I had a feeling something was about to go terribly wrong. Kathryn says during her psychotic episode she was seeing things that weren’t there and believing things that weren’t true. “I believed I was being tortured and punished because I had caused an apocalypse and killed most people in the world and the remaining survivors were torturing and trying to cremate me alive,” she said.